HomeConsulting for Volunteer Commitment AbroadInformation for OrganizationsJust do it now! Publication "Just do it now!" bezev is pleased to announce the release of our recent publication “Just do it now! 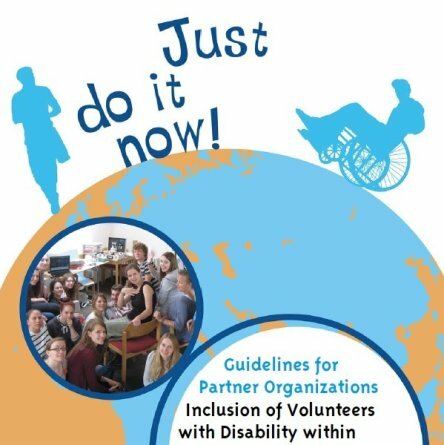 Guideline for Partner Organizations – Inclusion of Volunteers with Disability within International Volunteer Services”. The guideline is now available as a CD-ROM for only 15€ (shipping included); allowing you to download and print all available documents for optimized usage. The guideline is available in 4 languages: English, French, Spanish and German. If you would like to get a hardcopy of the guideline, you can still buy the 2014-version of the guideline for 15€ or get the hardcopy and CD-ROM as a package deal for 25€ (all prices include shipping).